Halloween parties can be as simple or as elaborate as you can imagine, but the best Halloween parties for kids have one thing in common: They stimulate the senses of the guests. From the sounds of crackling leaves, to the sight and taste of chocolate cupcakes decorated with frosting then covered in black jimmies to resemble bugs, Halloween is a holiday that is experienced by seeing, touching, smelling, hearing and tasting. For Halloween party hosts, how carefully you consider the age of your guests will determine if your party is a smash hit or an epic fail. When hosting a party for young children, your mantra should be too cute to spook. Until children are will into their elementary years, they are still can have a hard time distinguishing between fantasy and reality, so playing it safe is always a sure bet. Stimulate their sense of sight by using simple, classic decorations. Opt for white ghosts with smiles on their faces, cartoon-ish spiders, candy corns and bright orange pumpkins rather than scary monsters and vampires. Stimulate their sense of touch by providing a hands-on activity. Have children do a craft, like paint a pumpkin or decorate sugar cookies cut out in the shapes of pumpkins, cats and broomsticks. Stimulate their sense of smell by burning an apple or harvest scented candle (out of the reach and sight of the children) or by dipping cotton balls is scented oils and placing them out of reach and sight of children. Filling your home with the scent of a baking apple pie can also do the trick. Stimulate their sense of hearing by playing kid-friendly Halloween music. Choose sound tracks without words or kids favorites like Boo, Cackle, Trick or Treat by Sue Schnitzer or Dave Rudolf’s Halloween Spooktacular! Stimulate their sense of taste by serving up Halloween themed treats. Cut sandwiches into the shape of pumpkins and cats using cookie cutters, serve with a slide of sliced apple wedges and don’t forget the chocolate. Halloween doesn’t have to be scary to be fun. Stimulate your guests senses in an age appropriate way and your party is sure to be the hit of Halloween! 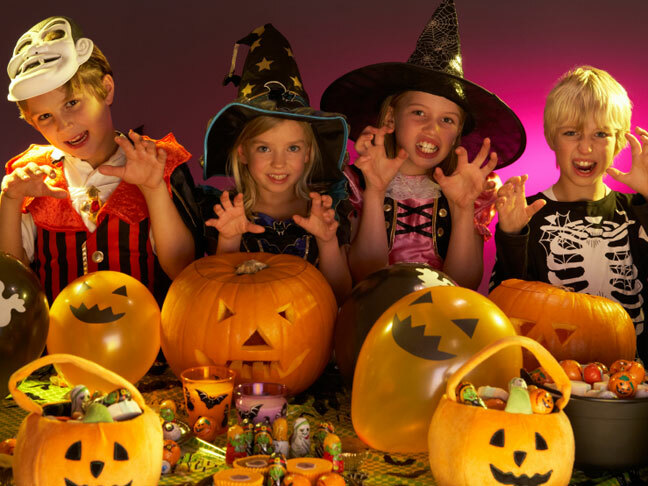 Do you plan on hosting a Halloween party for your children? Share your Halloween party planning tips below.